In addition to caring for your patients and clients, a normal day in your healthcare business includes collecting copays, coding claims, billing patients, processing incoming payments and, unfortunately, asking some patients to pay a bill that is overdue. We asked the CEO of Capital Collections Management, Jacob Corlyon, about the delicate task of collecting payments from patients, especially overdue payments and bad debts. A wholly owned affiliate of Bankers Healthcare Group, CCM specializes in consumer, commercial, secured, unsecured, pre default and post default collections, and collects monies owed on everything from credit card portfolios to secured and unsecured commercial loans. “It’s tricky to approach your patients about unpaid bills,” says Corlyon. As a practitioner, you may have provided care to certain patients and families for years, and feel emotionally invested in their situation. At the same time, your medical, physical therapy, dental or other healthcare business needs revenue to keep the lights on and pay staff salaries. You need patients, but you also deserve to be paid for your work. “Make sure you have a good chargemaster and coder on staff, this will help you get insurance reimbursements sooner,” he says. Let patients know how much of the bill is their responsibility at the time of service, if possible. If they are unable to pay their balance upfront, you may want to offer different financing options. 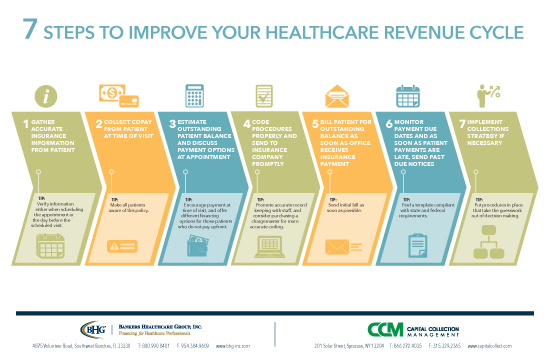 Consider how much you want to extend payments from your healthcare business, what terms you should offer and how these options fit with your revenue cycle. If a patient ignores the initial past due notices you’ve sent in the mail, it’s time to make a phone call. You’ll want to act fast—but before your staff makes that first call, have you provided them with the infrastructure they need to be effective? Having a collections program and training in place ensures that your staff is ready to ethically and legally collect payments on your behalf. “Practitioners need to be concerned about HIPAA rules and guard the privacy of their patients,” adds Corlyon. Staff should only speak about overdue patient bills with the right person, always verifying an identity before starting the conversation. Make sure that you are up to date on new rules and regulations. Good sources of information are the office of your state’s attorney general, your healthcare association or a regional medical association. If you ultimately outsource your collections, you will also want to be familiar with the requirements of the Federal Fair Debt Collection Practices Act. Take advantage of the resources available, including seminars and information on best practices. “You’ll want to have scripts,” says Corlyon. “If you follow one that is generally available, make it your own.” For example, if your policy of charging late fees or interest on overdue balances is used to bring in payments, include the specific details in your training script. Role-play, so that staff members know how to handle rebuttals and stall tactics, remaining confident, respectful and persistent during difficult calls. “Don’t let them be caught off guard,” he says. Develop a chronology for your collections efforts and include a cut-off date. After making collections phone calls and mailing late notices for 90 days, it’s time to either charge off the debt or send it to a third-party collection agency. It’s no longer cost effective to keep using your staff’s time on older, unpaid accounts. 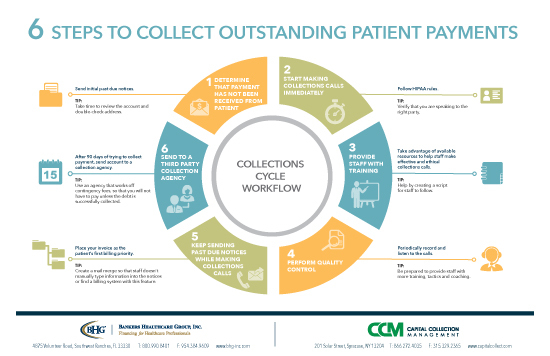 By discontinuing these collections efforts, you allow your staff more time to provide patient care, as well as accurate coding and billing on current patient accounts. Why do sick people quit their Medicare Advantage plans?